ServiceLink Resource Center has on-site Certified Medicare Counselors who can educate and counsel clients on issues related to Medicare health insurance, including understanding their benefits, reading their statements, appealing decisions, applying for benefits and programs and being aware of healthcare fraud and abuse. You may call for an appointment Monday through Friday from 8:30 to 4:30. 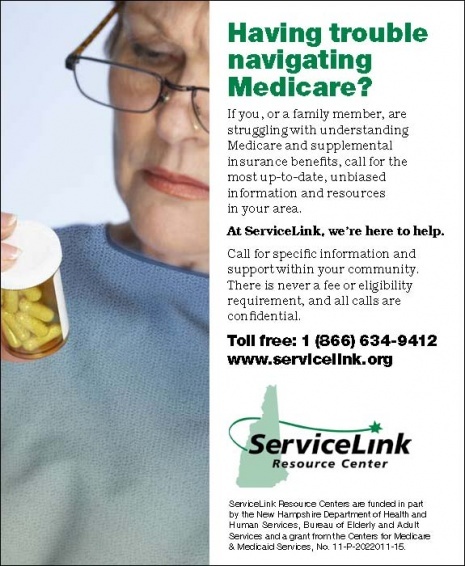 For more information, or to speak with the Medicare Specialist, call Toll Free 1-866-634-9412 or locally at (603) 528-6945.